who i am calling oliver the inspiration owl is helping me out. i made him today and i am so in love with him that there is no way i am listing him on my etsy. i also came home to half of my hambly goodies! yummy vanilla-scented transparencies and rub-ons. once the other half of my order comes i will take picture. so, tommorow is the big tattoo day! can't wait! i'm going to make sure to have a great big lunch and a luna bar for some extra protein! i'll post pics asap! oh my! too freaking cute! 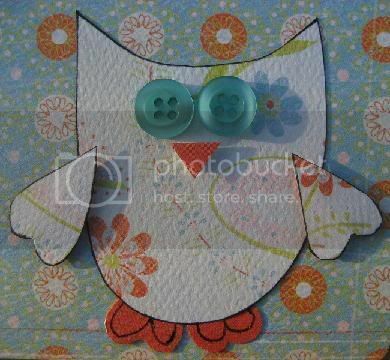 now just use that creative juice on a layout-your scrappers block sure passed fast! can't wait to see pictures of the tat. LOVE owl! don't worry about it dearie. it'll pass :) you'll realise one night when you can't get to sleep that you desperately need to scrap something! sometimes shopping helps ;) heh, and i mean real shopping, not for scrap supplies! can't wait to see the tat! did you ever find someone to play photographer? Creativee block or whatever you want to call it is just part of the process- just know that it'll pass and new great ideas will always follow! Thank goodness it doesn't last forever! this owl is so so cute! !